Isnt this the cutest little elephant figurine?! I am going to use it as a ring holder. Hello fun jewelery organization. It was elephant week apparently! 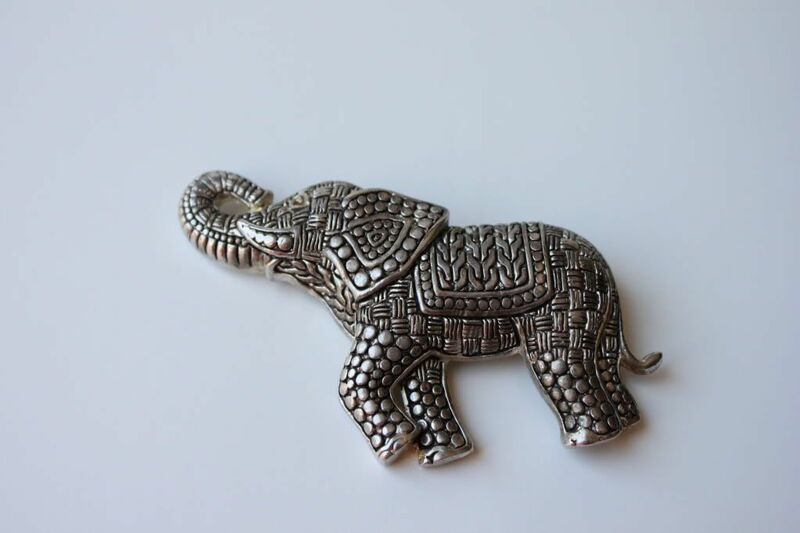 I also found a sterling silver elephant brooch. I plan on taking the back pin off and attaching it to a plain cuff that I have. 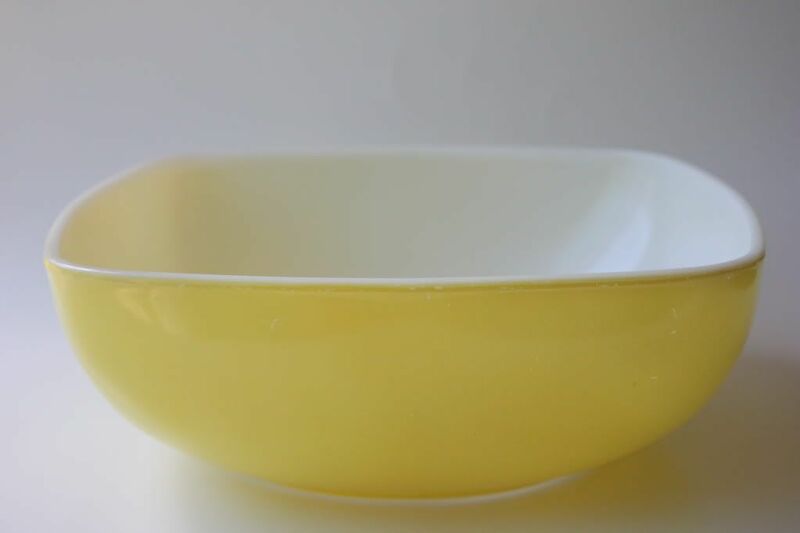 A bright yellow Pyrex bowl. I have this dream of opening my cupboards and all I see is brightly covered vintage Pyrex dishes. Get an early start. Early bird gets the Pyrex! Plus...in the morning things are more organized, the employees are generally happier and there are not tons of people yet. Just a little observation. We are huge fans of elephants (my daughter and I) I adore this post! Thanks for sharing! I LOVE elephants too! 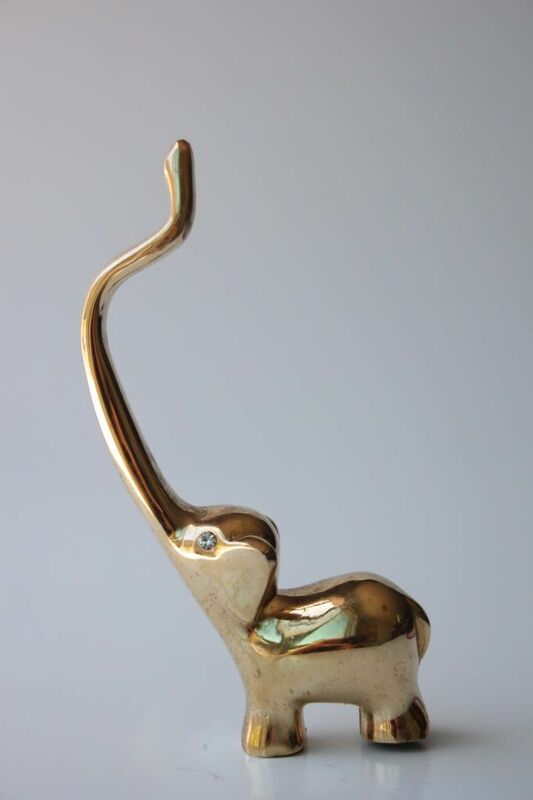 They are my favorite pachyderm :) That first little elephant that you're going to use as a ring holder is SO cute! I've been looking for a cute little ring holder - you found a perfect one! I said I was going to start going to the thrift stores every week didn't I? Crud, I forgot. Okay, next week. No really, I'm putting it on the calendar. I think I should plan the same day every week so it turns into a ritual. Gotta start the kiddos diggin' through trash at a young age, right? I like the ring holder. Super cute. okay those are all great purchases. i'm really loving that ring holder elephant. i don't have a ring holder (really need one) and think that's absolutely brilliant to use that little guy. also love the vintage pyrex. totally reminds me of the bowls my mom had when i was a kid. now you just need a light green and orange one! i have been seeing these little elephants everywhere! My mama has a pantry full of colorful pyrex bowls! Keep digging for them at the thrift stores, she's found so many over the years! what great finds. i love the elephant ring holder. you'll have to post an update when you attach that silver elephant to the cuff that's going to look amazing. pyrex is awesome! i have a friend that just collects the green pyrex. pyrex is awesome! those little elephants are precious! i need to start checking out the thrift stores more often. Great finds! Do they know you on a first name basis yet?! amazing finds! i LOVE that elephant. and i am ALWAYS a sucker for that vtg pyrex!! and in yellow!! i die! I love that elephant ring holder! As always, such great finds Lindsay!!! I love the Thrifty Momma Thursdays - and it's such a catchy name too!! Oh Lindsay! That' elephant ring holder is so cute, as is the brooch. I'm a lover of vintage Pyrex too and I really don't know why I just don't take the doors off my kitchen cabinets. They very rarely get closed! My kitchen looks like that kitchen scene out of "Sixth Sense" sometimes. Ahhh i WANT that ring holder!!! such an awesome find!!! Hi! Thanks so much for your sweet comments on Yummy Mummy. I'm so happy to have found your lovely blog. I'm now following through gfc so I don't miss anything! Please come link up something creative you have found or made in my linky party that is now up at the bottom of the s'mores post! I got a 1970s casserole dish (Pyrex) with the green background and white flowers for $.25! I love thrifting!!! Oh yes- I completely forgot I cam here to tell you I wish I had the Elephant Ring Holder... SO CUTE! Awesome finds! Thanks for linking up! That first elephant is sooo cute!! Wow, you do really well thrifting! WOW,love them!! !The 1st one is amazing!!! The ring holder is adorable. My grandmother had unique things like this for her jewelry. It so pretty. Love the yellow pyrex. I have one of those too! I agree, it would be so cool to open up a cupboard and see all brightly colored vintage pyrex bowls! Love that sterling elephant, how fun! great finds! I LOVE that little gold elephant! And turning it into a ring holder is such a great idea! Loving your little gold elephant! OMG I love the elephant as a ring holder. What a fantastic use for it. I loveeee elephants!! Both such a great finds.